Facebook is going Twitter way and here is another plug to prove the same in the form of first ever desktop client for Facebook. 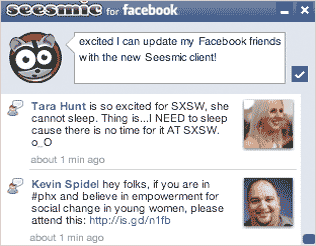 From the makers of very popular Twitter client ‘Twhirl– here comes Seesmic for Facebook. It is a downloadable Adobe Air application that allows you to update Facebook status from the desktop. Currently, it only support text updates with picture and video updates coming soon in future versions. Using this application you can keep track of updates from Facebook friends and update your current Facebook status. Download Seesmic for Facebook (also Adobe Air) and interact with Facebook friends from desktop. It is a nice beginning with makersÂ planning a desktop client with integrated Twitter and Facebook support – looking forward!